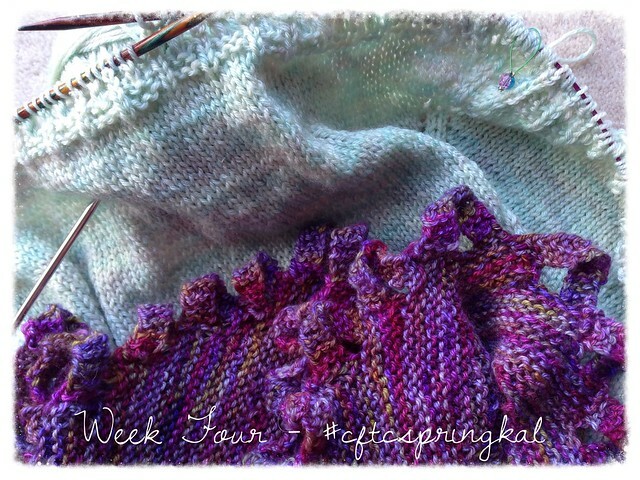 Spring Kal Week 4: Knitting Along ... but not on that! This week's knitalong update - a day early so I can post about the Sewing Bee final tomorrow - is really a confession. I have been neglectful this week (boo)... but the second sample for another new design will soon be finished (yay). It appeared just as I was about to start the 28th loop - a nagging feeling that wouldn't go away until I cast on this idea I've had for a long time. I am totally blaming the gorgeous "Island Beach" yarn pictured above which was custom-dyed by Devon Sun Yarns, and is based on the picture that inspired the design. (The first sample worked out really well in cheap sock yarn from my stash, but this is something else - merino/bamboo scrumptiousness!) Can't wait to show you more. I'm better at knitting than technology. Just added the link to my latest blog post.